Not only is Timberline Lodge one of the region’s most iconic features, it sits on the flanks of another: Oregon’s famed Mt. Hood. Timberline is a symbol of the Central Cascades, and no visit to the region is complete without seeing it. The setting at about 6,000 feet on Mt. Hood’s south side offers a spectacular view of the highest point in Oregon in one direction and several sister volcanoes in the other. The building itself is the epitome of regional Cascadian architecture, with basalt masonry, huge log beams and a peaked roof. Even the furnishings in this National Historic Landmark tell a story of the depression-era WPA and FAP craftsmen and -women who created the exquisite furniture, metalwork, carvings and textiles that adorn the lodge. But Timberline is more than an attraction; it is an experience. And it is not just about history; it is about the Central Cascades today. The lodge provides unique accommodations and fine dining, featuring fresh Northwest ingredients. Timberline is a year-round destination. During the summer months, it is the jumping-off point for a climb to the summit or a hike along the Timberline Trail to view a kaleidoscope of snowfields, alpine wildflowers, volcanic formations and sweeping vistas. In the winter, skiers and snowboarders flock to the slopes. U.S. Forest Service interpretive programs about the lodge and the area inform thousands of visitors each year. 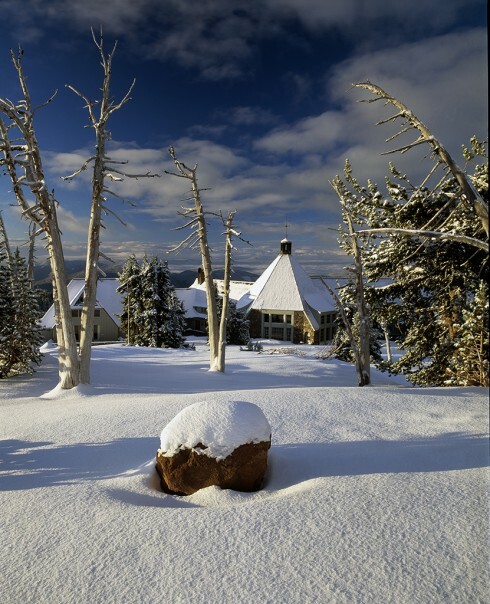 Simply put, Timberline Lodge is a Central Cascades tradition and one of the most-loved places in the Pacific Northwest.